Snowdrops generally flower between January and March, making them a true winter flower. While they’re not a native species to the UK, they’ve been here long enough to be well established in our woodlands and countryside, and there are plenty of places where you can find them blanketing the ground in a pretty display (see below for some suggestions!). They are far too gorgeous to pick – not to mention all parts of the plant are poisonous – so instead we made our own! 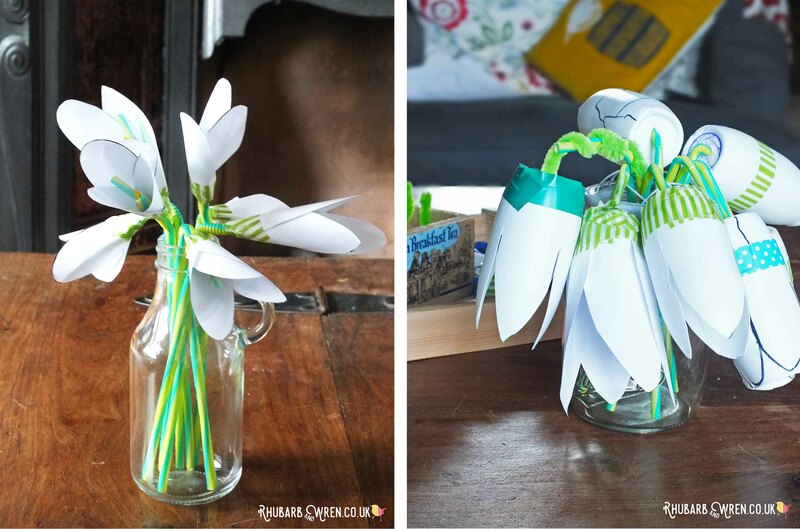 Snowdrops made from paper or plastic bottles – two crafts, one flower! 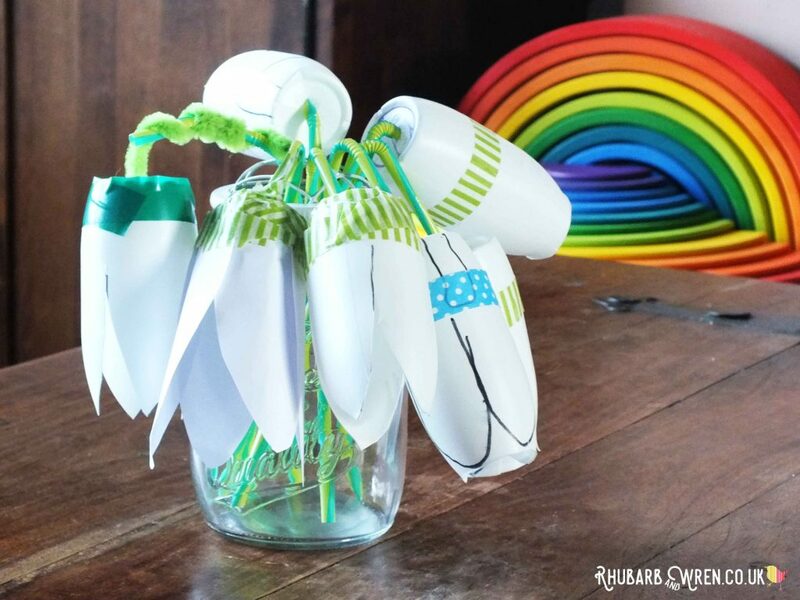 We used two different methods to create our snowdrops, and the idea was very much for the kids to make these completely by themselves while I attempted to drink a cup of tea whilst it was still hot. So the process of making, rather than the end result, was what we focused on and our finished bouquet shows more personality than horticultural perfection! However it is possible to make some really pretty and lifelike snowdrops using these methods – feel free to be more perfectionist than us when making your own. The first method we used to make our snowdrops is based around using some straws and empty plastic bottles (the little white ones that probiotic yogurt drinks come in). For my four-year-old, I did a little prep work to set the task up for her, but she did everything else herself. In fact, halfway through she decided that she had a better way of doing things and took charge of the whole operation. I love that she felt empowered and inspired enough to decide on a new way of making these, so even if the end result is slightly less snowdrop-y, I still love them! Yoghurt drink plastic bottles are a great craft resource for junk modelling. 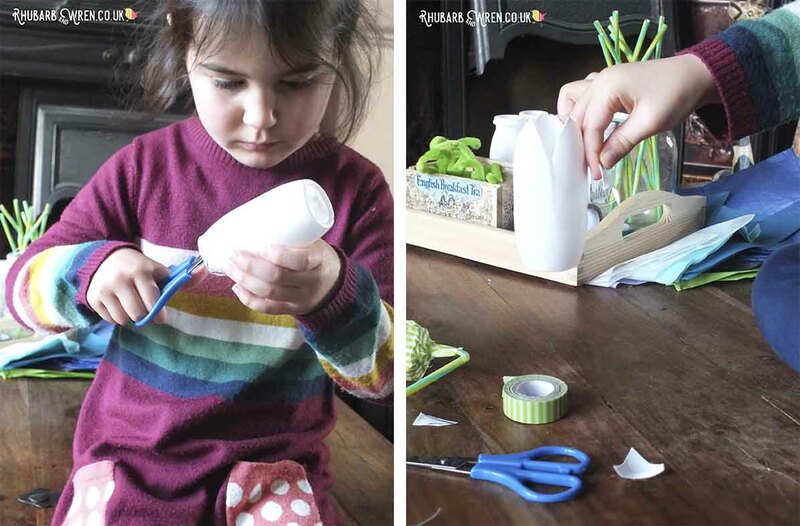 Plastic bottles, bendy straws and a bit of tape – all you need for this snowdrop craft! 1. 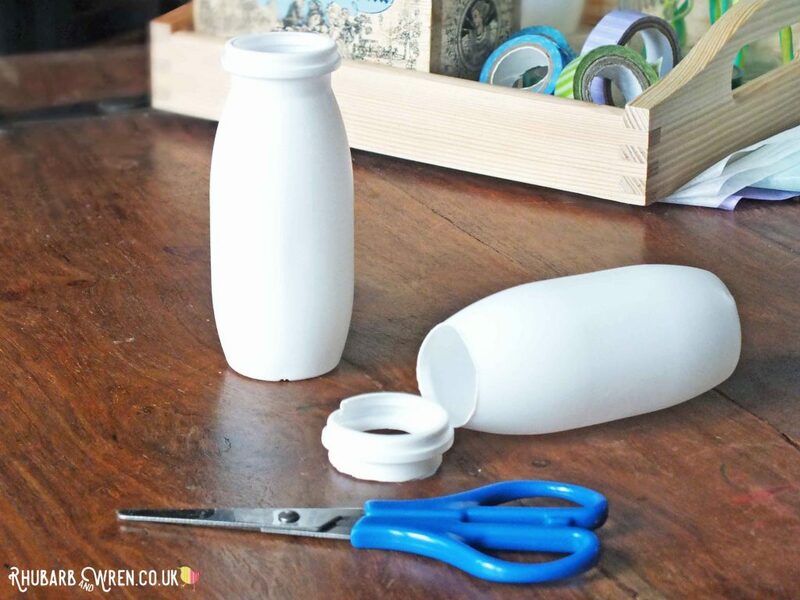 Before you begin, use a sharp pair of scissors to cut off the top collar of the bottles, and a sharp pointed tool, skewer or knife to make a hole in the base (large enough to insert the straw later). Removing the bottle collar makes it easier for the kids to cut the snowdrop petals (or tepals, as they are correctly called!). The collar on these plastic bottles is hard to cut, so remove before giving to the kids. 2. Next, draw or let the kids draw the tepal outlines onto the bottle as a guide for cutting. Snowdrops have three exterior tepals (there are another three small ones inside the flower too) – you may notice some of our flowers are therefore anatomically incorrect because they got a bit carried away marking out extra petals, but we were being pretty relaxed about sticking to the original design idea and the kids adapted and changed things as we went along. 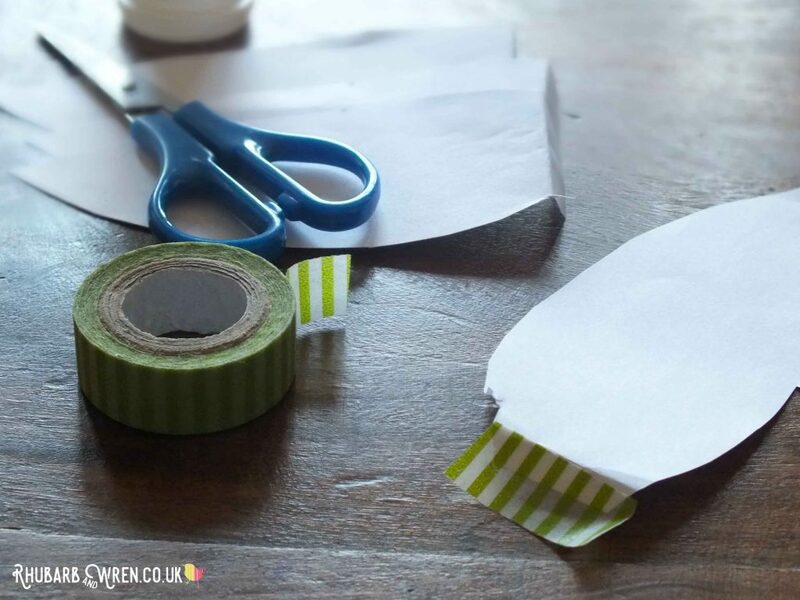 Some of the bottles ended up decorated with washi tape and pen rather than cut – and that was fine! Drawing petals on bottles is tricky! 3. Let the kids cut out the tepals. The plastic bottles we used are made of a very soft plastic, so once we removed the collar of the bottle, the tepals (must. use. correct. word!) were easy to cut, even for my four-year-old. If the petal shape, with its curved tip, proves a little difficult for your youngster, try marking triangles instead (so that the petal/tepals are pointed) which are much simpler to snip and can be rounded off afterwards. Be aware that plastic can be quite sharp once it’s been cut, though as ours was so soft this wasn’t a problem for us. Cutting an unusual material and an interesting shape is a great scissor-skills challenge for preschoolers. 4. 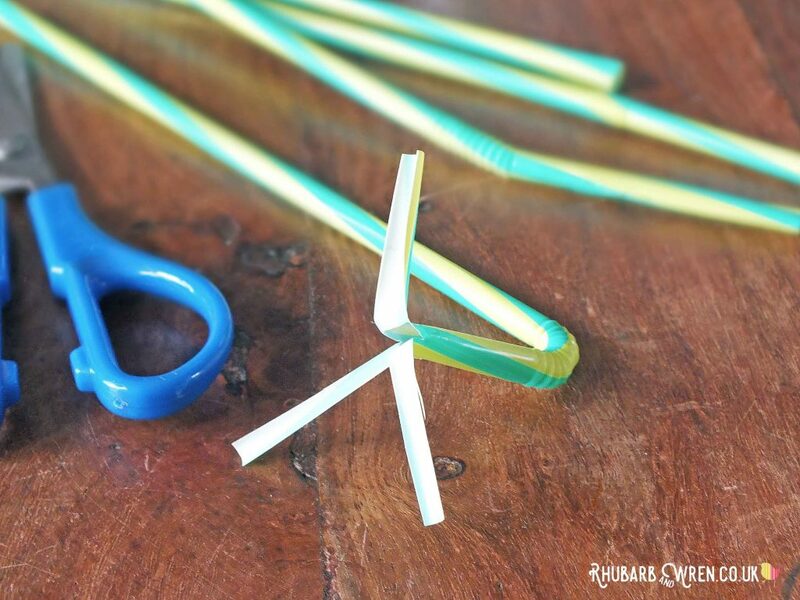 Finally, the kids can insert the top of a bendy straw into the hole you made in the base of the bottle, and add a strip of green tape around the base. 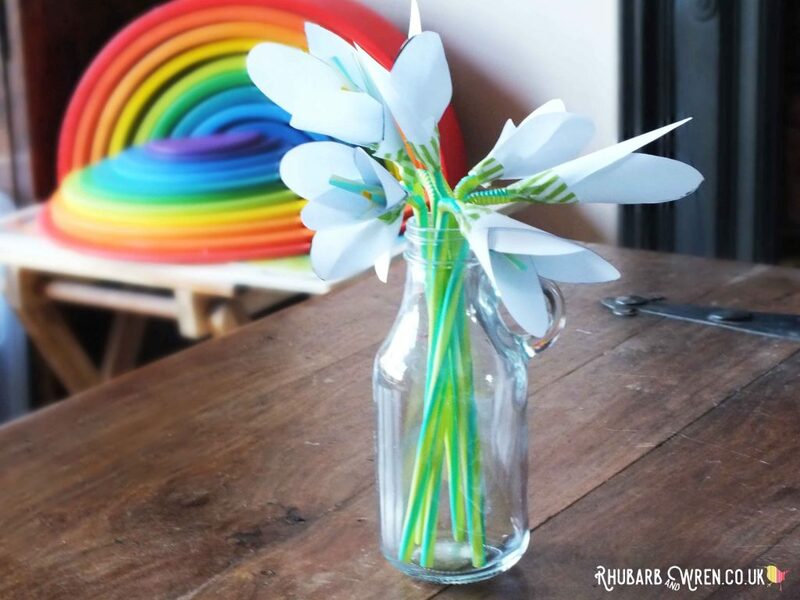 As our straws were green, the kids didn’t feel the need to use tissue paper or washi tape to make them look more stem-like, and T-Bird was having so much fun arranging her ‘flowers’ in our mason jar vase that she didn’t want to add leaves either. You can, of course, encourage the kids to tape some tissue or crepe or coloured paper leaves onto the base of the stem to finish off. 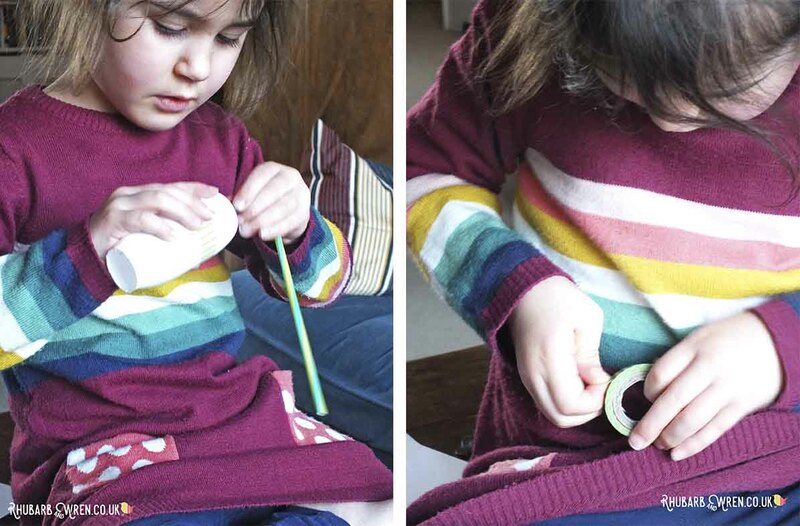 Inserting the straw and finding the end of the tape are great challenges too! 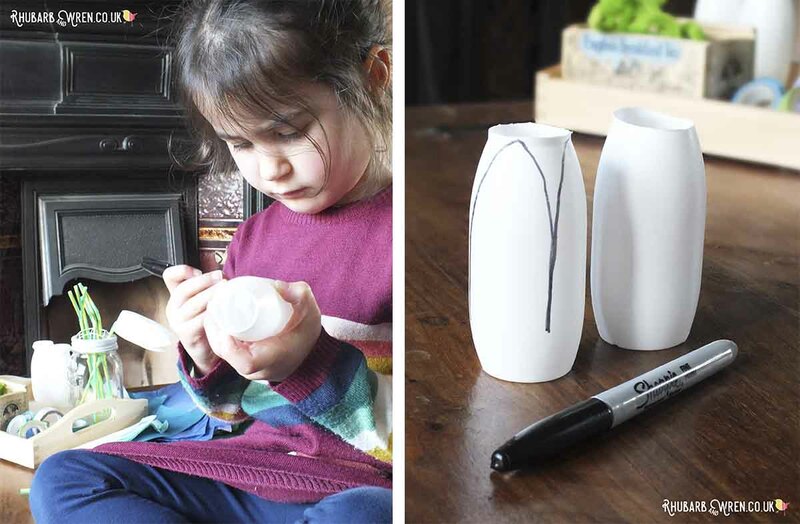 While we made a few flowers this way, T-Bird soon decided that she wanted to decorate the last few bottles with a combination of marker and colourful washi tape. Having listened to the instructions for making them ‘mummy’s way’, she was soon busily informing me of ‘the proper way to do it’ and demonstrating as she worked. 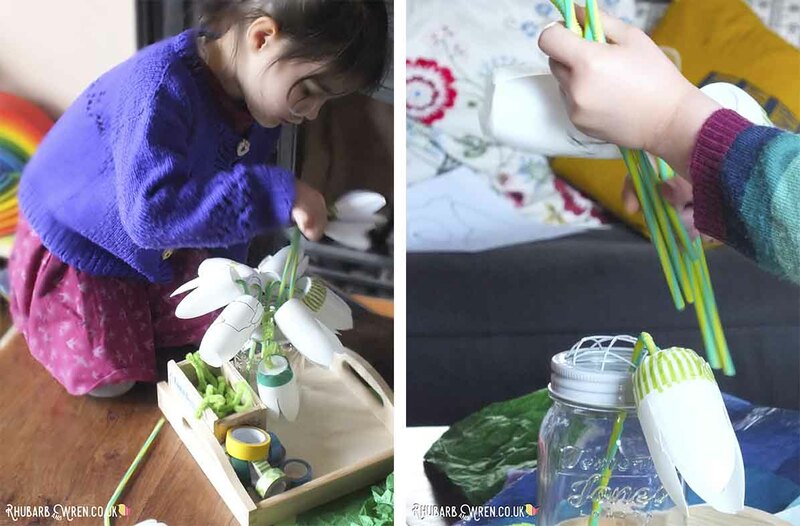 This used up our last few horded bottles, so when she decided she wanted to make some more snowdrops, we turned to our alternate method – the paper flower! 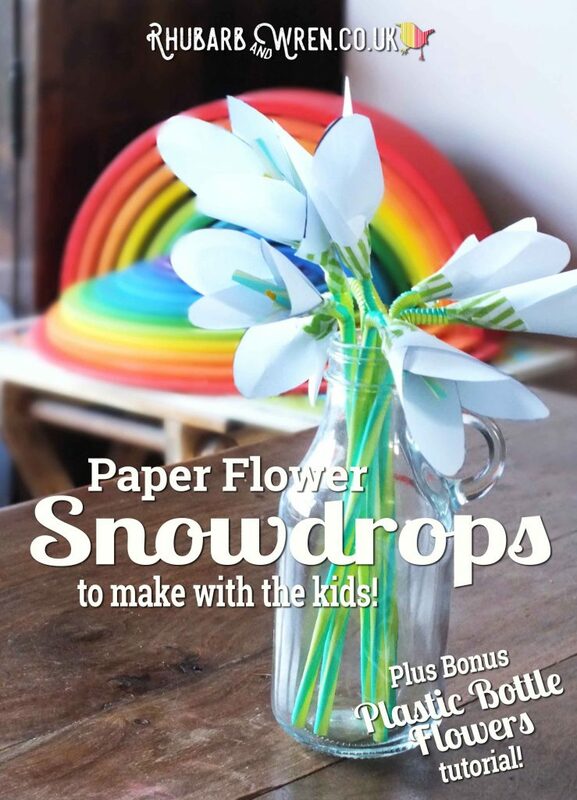 This way of crafting snowdrops is even simpler than the first, and doesn’t require any ‘special’ junk – so you can do it even if your family are not addicted to drinking probiotic yogurts. In fact, I think that this version is even prettier than than the bottle one, while still being a great workout for scissor and fine motor skills. 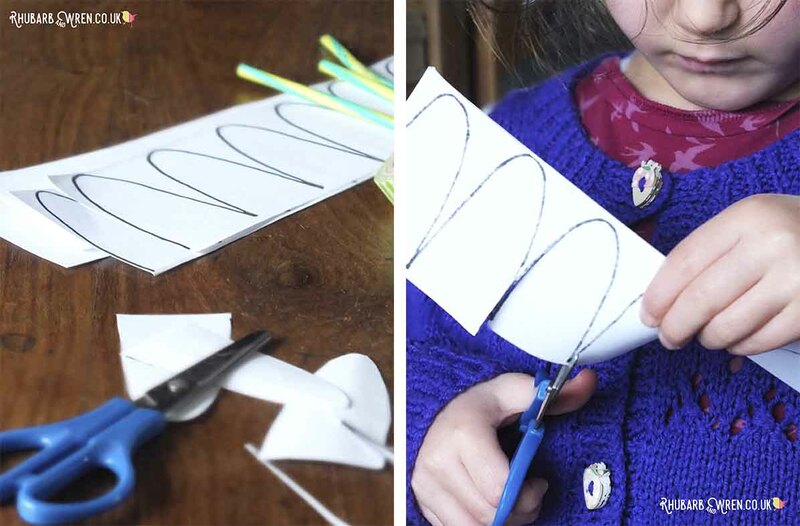 Beautifully delicate and life-like, our paper snowdrops are easy enough for preschoolers to make. Scissor skills practice cutting out a row of flower petals. straws rather than the tepals/petals. To create the three inner tepals, snip about a centimetre or two from the top end of the straw so that it separates into three. 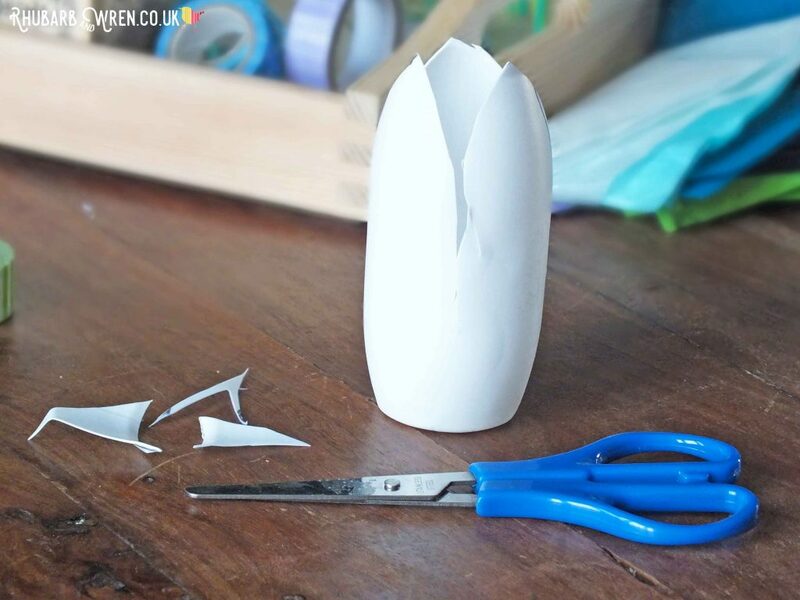 Making the inner heart of a paper snowdrop. 2. Next, take a strip of yellow washi (we actually used -affiliate link alert – yellow electrical tape for this – it’s shiny and just the right shade of yellow! ), and roll it at a slight angle to create the centre of the flower. Insert it into your three-prong straw. 3. Now for the petals. I cut my A4 paper into long strips and drew a line of simple tepal-petals (roughly snowdrop shaped) with a marker pen, for T-Bird to cut out. Older kids could do all this themselves. 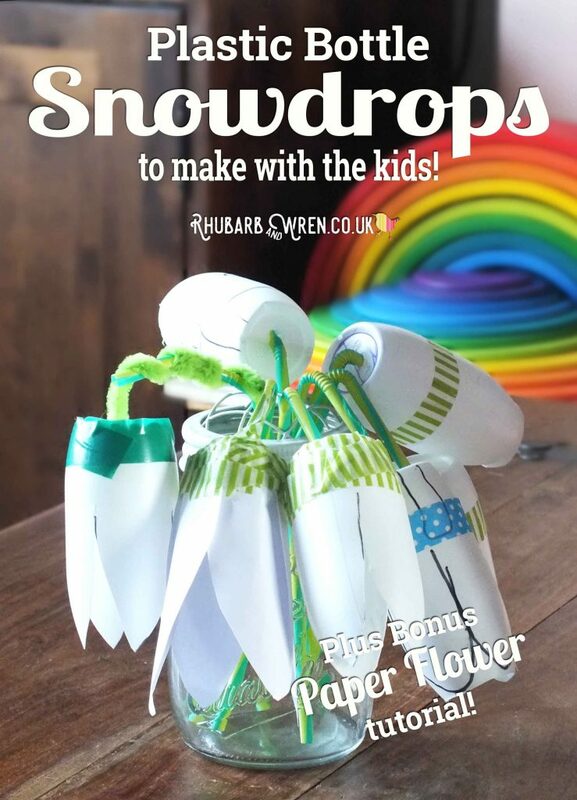 Drawing a row of petals for little ones allows them to practice cutting out. 4. 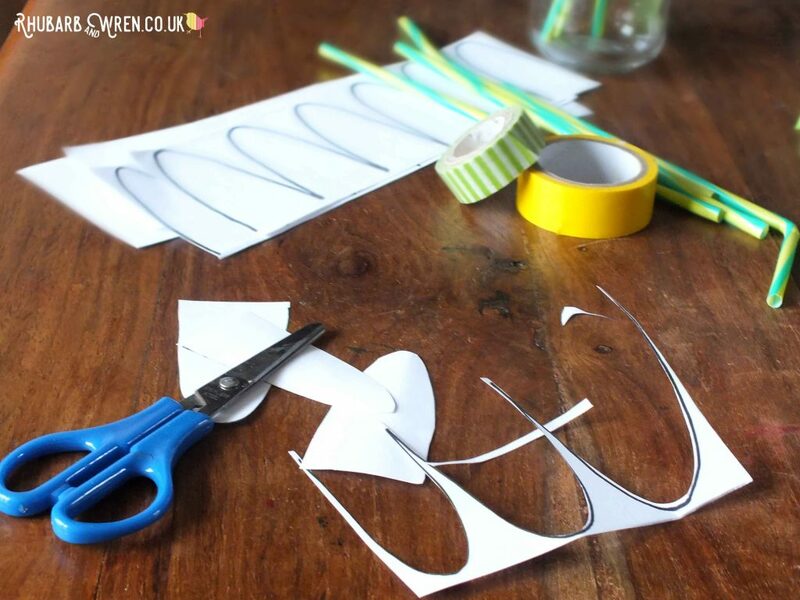 Take three of your cut-out petals and attach a piece of washi tape along the bottom – making sure to leave a sticky flap so that you can use this tape to attach the petal to your straw-stem. Once they’ve cut out the petals, the kids can snip some washi tape. 5. Wrap each petal/tepal around the straw one at a time, so that they enclose the three pronged end that you made already. Don’t wrap these too tightly – it looks more organic if you squish the bottom sections a little and allow the flower to be more open. Add more tape if necessary to secure the tepals in place once all three are in position. Attach the petals around the straw, pinching in the base of each one. 6. 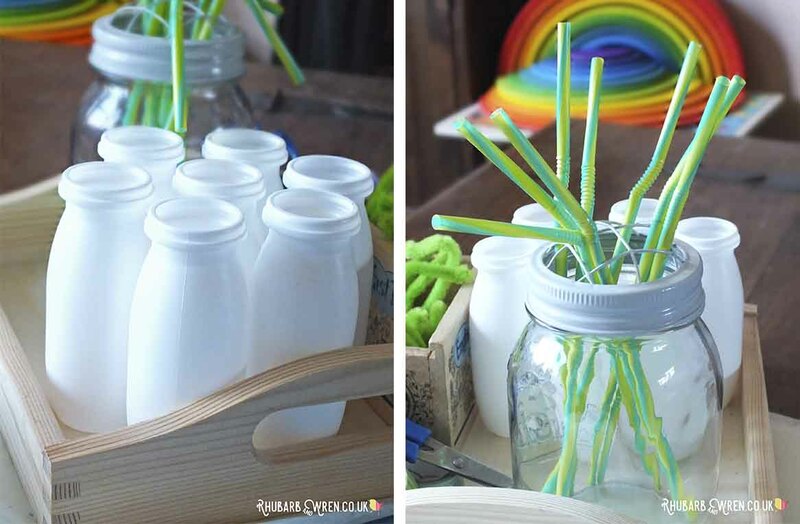 As with the bottle versions, if you want you could get the kids to finish off by wrapping the straw in green tape, or cover it in coloured paper or tissue, and make leaves to attach to the bottom of the stem. Mine preferred to leave theirs with a bare stalk, and then spent a happy half hour or so selling each other flowers and trimming the bottle versions’ stalks to make elaborate flower arrangements in our vases and jugs. Flower arranging is almost as much fun as making them! We did this craft on a day that was too cold and rainy to venture out, but if you fancy seeking out some real snowdrops to study first, the BBC’s Country File site has a great article on the best snowdrop walks in Britain (plus details on how to grow your own), while the National Trust also has regional lists of snowdrop walks on their properties. If you do see any snowdrops flowering, the Woodland Trust want to know – snowdrops are one of the species they are monitoring on their Nature’s Calendar, so get the kids photographing and recording their finds on the website. The crafts on this page use pretty standard materials that you probably already have. If you need to stock up, here are some examples from Amazon of the types of things we used. These are affiliate links, which means that if you click through and buy, I will receive a small amount that goes towards the running of this website without costing you a penny extra. Thank you for your support! Looking for more things to do with the kids? Check out some of my other activity ideas! Craft, Junk Modelling, Preschool Activities, Recycling, Winter. Bookmark.